Cet article examine la singularité des Oïrats par rapport aux Mongols pour reconsidérer la pratique consistant à les désigner comme des “Mongols occidentaux”. Les Oïrats, qui ne faisaient pas partie des Mongols originels menés par Gengis Khan, sont devenus, après l’éclatement de l’empire mongol, les Dörben Oïrat, une confédération nomade principalement composée de groupes non-mongols. Les tests ADN portant sur le chromosome Y des Kalmouks et des Mongols modernes montrent que ceux-ci ont des origines hétérogènes. Les Oïrats, bien qu’ils se considèrent comme un peuple mongolique, considéraient les Mongols comme une entité distincte. De même, les Mongols voyaient les Oïrats comme des ennemis étrangers (qari daysun). Les histoires chinggiside et timouride d’Asie centrale font également la différence entre les deux. Par conséquent, je suggère que les historiens reconnaissent les Oïrats comme un peuple distinct, comme les Xiongnu, les Xianbei, les Kök Turcs, les Ouïghours et les Kirghizes. This article examines the uniqueness of the Oirats in relation to the Mongols to reappraise the practice of designating them as “Western Mongols”. After the breakup of the Mongol Empire, the Oirats, who had not been part of the original Mongols led by Chinggis Khan, transformed into the Dörben Oirat, a nomadic confederation mostly made up of non-Mongol groups. The Y-chromosome DNA testings of the Kalmyks and modern Mongols show that the two have heterogeneous origins. The Oirats, although they viewed themselves as a Mongolic people, regarded the Mongols as a separate entitiy. Likewise, the Mongols viewed the Oirats as foreign enemies (qari daysun). The Central Asian Chinggisid and Timurid histories also differentiated between the two. Therefore, this article suggests that historians should recognize the Oirats as a separate people like the Xiongnu, Xianbei, Kök Türks, Uighurs, and Qirghiz. How were the Oirats viewed by their contemporaries? I would like to express my sincere gratitude to my friends Metin Bezikoğlu and Shuntu Kuang for helping me obtain and read relevant texts in the Başbakanlık arşivi Name-i hümâyûn defteri and the Qing Shilu, respectively. 1 The Kalmyks have inhabited the northwestern Caspian region from the mid-17th century. 1The Kalmyks, a Buddhist Mongolic people residing in the Republic of Kalmykia (Khalmg Tangch), a constituent republic of the Russian Federation1, the Torghud (Cl. Mo. Torγuud, Oirat Mo. Toroγoud)2 living in Xinjiang, China, and the Dörböd (Cl. Mo. Dörbed), J̌aqačin, and Öölöd (Cl. Mo. Ögeled) residing in western Mongolia, all descend from a nomadic people historically known as the Oirats (Cl. Mo. and Oirat Mo. Oyirad). Although their modern descendants are now scattered in Russia, China, and Mongolia, the Oirats were once the most powerful nomadic horsemen in the steppes of Inner Asia during the post-Mongol period. Led by such charismatic leaders as Esen Taisi (r. 1439-1455) and Galdan Bošugtu (r. 1671-1697), they established formidable, albeit short-lived, nomadic empires, which harassed their neighboring Chinggisid states, that is the Northern Yuan (1368-1691)3, the Moghul Khanate (ca. 1347-1680s, and the Uzbek (1501-1747) and Qazaq (1450s-1848) khanates. The Oirats of the Volga region, i.e., the Kalmyks, alone menaced their nomadic neighbors, including the Noghay Tatars, from the mid-17th century onwards in such a way that an 18th-century commentary on the English translation of Abū al-Ghāzī Bahādur Khan (r. 1644-1663)’s Šejere-i Türk, a history of the Chinggisids up to the Arabshāhid Uzbek dynasty, states that the Crimean Tatars “are the best disciplined of all the Tatars, tho the Callmaks are infinitely braver than they” (Abu’l Ghâzi Bahâder 1729, p. 602). If the Manchu Qing state (1644-1911) had not destroyed the Zunghar (Cl. Mo. J̌egün Γar, Oirat Mo. Zöün Γar) Khanate in the mid-18th century, perhaps Kazakhstan might be called “Kalmakia” today4. To use René Grousset’s term for the Turko-Mongols (1939, p. 10), the Oirats were arguably the last of “the governing races, imperial nations” (les races de commandement, les nations impériales) of Inner Asian origin. 7 Dörbön Oyirad is transcribed from Oirat script. 2In modern literature, the Oirats and their offshoot, the Kalmyks, who share the Mongolic language, parts of their history, some culture, and religion (Tibetan Buddhism) with the Mongols, are often referred to as “Western Mongols.” For instance, René Grousset calls them “Western Mongols” (les Mongols occidentaux) (1939, p. 599)5. However, the Oirats and the Mongols not only had separate origins, but also formed distinct identities during the post-Mongol period as will be discussed below. In this article, I examine in detail the uniqueness of the historical Oirats in relation to the Mongols in order to reappraise the practice of designating them as “Western Mongols”6. For this purpose, I will first examine the separate origin of the early Oirats and demonstrate the uniqueness of the nomadic confederation they later developed into, i.e. the Dörbön Oyirad7 (Cl. Mo. Dörben Oyirad, Four Oirats) in relation to the Mongols. I will then investigate the question of how the Oirats were viewed by the neighboring Manchus, Northern Yuan Mongols, and Turkicized Chinggisid uluses8, or peoples, and also how the Oirats viewed themselves. 4When Chinggis Khan founded the Mongol ulus in 1206, the Oirats, inhabiting the forest region of northwestern Mongolia, and the Mongols, originating in northeastern Mongolia, did not form one nomadic people. In the Secret History of the Mongols, a 13th-century Mongol history of Chinggis Khan and his ancestors, the Oirats, called the People of the Forest (oy-yin irgen) (Ligeti 1971, p. 168; hoi-yin irgen in de Rachewiltz 2004, 1, p. 849), are not included among the branches that constituted the Mongols, many of which are described as being descended from Alan Qo’a, the mythical ancestress of Chinggis Khan (de Rachewiltz 2004, pp. 2-3, 7-10). Instead, the Oirats are described as a non-Mongol people like the Kereyid and Naiman. They are rather briefly mentioned in this history as one of the forest peoples that submitted to Joči, son of Chinggis Khan, in 1207 (ibid., 1, p. 164). 5The separate origins, or “pre-conquest” division, of the Oirats and the Mongols are also noted in the Jāmiʿ al-tavārīkh, the universal history written by Rashīd al-Dīn (d. 1318) for his Mongol overlords. In his work, Rashīd al-Dīn classifies the Inner Asian nomadic peoples into four different groups9. The first group is called “the peoples of Oghuz” (aqvām-i ūghūz) and includes the twenty four branches of the Oghuz and other Turkic peoples (Rashīd al-Dīn 1988, p. 29; 1998-1999, 1, p. 27). The second group is called “the peoples of the Turks that are now called Mongol” (aqvāmī az atrāk ki īshān-rā īn zamān mughūl mī-gūyand) but each people in this group had its own specific name prior to being called Mongol (1988, p. 47; 1998-1999, 1, p. 37). The third group is called “the Turkic khanates or peoples that have also had separate monarchs and leaders” (aqvāmī az atrāk ki īshān nīz ʿalā-ḥidda, pādshāhī va muqaddamī dāshta-and) and the peoples in this group were not related to the second group or the Mongols (1988, p. 87; 1998-1999, 1, p. 61). The khanates or peoples, such as the Önggüt, Naiman, Kereyid, Qirghiz, Tangut, as well as the Uighur and Qipchaq, are included in this group (1988, pp. 87-110; 1998-1999, 1, pp. 61-78). The Mongols formed the fourth group called “the Turkic peoples that were anciently styled Mongol” (aqvāmī az atrāk ki dar zamān-i qadīm laqab-i īshān mughūl būda…) (1988, p. 111; 1998-1999, 1, p. 79). This Mongol group was divided into the Dürlükin Mongols, who constitute the commoner Mongols, and the Niru’un Mongols, who are descended from Alan Qo’a. The peoples, such as the Qunqirat and Mangqut, belonged to the former Mongol group, while the peoples such as the Barlas belonged to the latter Mongol group (1988, pp. 111-162; 1998-1999, 1, pp. 79-112)10. 6Importantly, in Rashīd al-Dīn’s classification of Inner Asian nomadic peoples, the Oirats are not included in the Mongol groups. Instead, they are included in the second group along with the nomadic peoples, such as the Jalayir and Tatar even though Rashīd al-Dīn was aware that the Oirats spoke a variant of the Mongol language (1988, pp. 76-80; 1998-1999, 1, pp. 55-57). Furthermore, while Rashīd al-Dīn writes that the Merkit “are a sort of the Mongols” (ṣanfī az mughūl-and) (1988, p. 71), and that the Kereyid “are a Mongol stock” (nauʿī az mughūl-and) (1988, p. 87), he does not describe the Oirats similarly. Rashīd al-Dīn also remarks that the Oirat commanders in Iran and Turan “know their origin and lineage that were not known to others” (1988, p. 79; 1998-1999, 1, p. 57), which indicates that the Oirats and the Mongols had separate genealogies and origins. 7Over the course of the 13th and 14th centuries, the Inner Asian nomadic peoples that had been incorporated into the Mongol Empire amalgamated into several Chinggisid uluses, or peoples, such as the Chaghatays (Moghuls, Timurids)11, Jočid ulus (Uzbeks, Qazaqs, Tatars), and Northern Yuan Mongols. However, the Oirats, centered in western Mongolia, were an important exception to this phenomenon since they developed into a major non-Chinggisid ulus. From the turn of the 15th century, the Oirats began to challenge the Mongols led by Chinggisid khans, who had been ousted from China by the Ming Dynasty (on the Mongol-Oirat rivaly, see Jamsran 2010, pp. 497-507; Miyawaki 1984, pp. 136-173; for a brief history of the Oirats, see Miyawaki 2003, pp. 141-151). Unlike their 13th-century predecessors, the 15th-century Oirats formed a tribal confederation known as the Dörbön Oyirad, or Four Oirat, mostly made up of the original Oirat peoples and other non-Mongol peoples. This new Oirat confederation showed a markedly different composition from the Chinggisid uluses of the post-Mongol world. The latter were typically made up of the original Mongol peoples, that is, the branches named as the Dürlükin Mongols and the Niru’un Mongols in the the Jāmiʿ al-tavārīkh, and the non-Mongol peoples from both the Mongolian and Qipchaq steppes. The modern-day Mongols are thus made up of the original Mongol groups, such as the Mangqut, Qonggirat, Baya’ut, Üüsin/Ü’üšin, Ba’arin, Besüt, Eljigin and Qatagin, and the nomadic peoples of non-Mongol origin, such as the Jalayir, Uighur, Naiman, Kereyid, Tangut, Önggüt (Enggüd), Qaračin (partly Qipchaq) (for the Qaračin, see Okada 1984, p. 150; Atwood 2004, p. 456), and Alan (Asud), the last two being from the Qipchaq Steppe (for the modern-day Mongols, see Badamhatan 1987, pp. 26-52)12. Similarly, the Chaghatays, Uzbeks, Qazaqs, and (Crimean) Tatars consisted of the original Mongol groups, such as the Barlas, Barin, Dughlat, Manghit, Qunghrat, and Uyshun (Üüsin), and the non-Mongol peoples, such as the Jalayir, Kereyid, Naiman, Önggüt, Tangut, Tatar, and Uighur, that were the peoples of eastern Inner Asian origin, and the Arghin, Qipchaq, Qanqli, and Alan (Shirin)13, that were the peoples of the Qipchaq Steppe origin (for the Qazaqs and Uzbeks, see Sultanov 1982, pp. 7-51; for the Timurids, see Manz 1989, pp. 154-165 and Ando 1992, pp. 66-217; for the Moghuls, see Mano 1978, pp. 49-52 and Yudin 2001, pp. 72-82; for the Crimean Tatars, see İnalcık 1955, p. 753 and Fisher 1978, p. 22). 8In contrast, the major Dörbön Oyirad groups, such as the Torghud, Dörböd (Cl. Mo. Dörbed), and Xoyid (Cl. Mo. Qoyid), among others, were non-Mongols by origin14. An exception was the Xošoud (Cl. Mo. Qošud), who joined the Dörbön Oyirad in the 14th century. According to a number of Mongolian, Oirat, and Chinese sources, they were originally Mongols led by the descendants of Qasar, brother of Chinggis Khan (Okada 1987, pp. 203-207; Wu 1941, pp. 185-186). The Xoyid were descended from the original Oirats (Okada 1987, p. 196), while the Torghud were descended from the Kereyid15. With regard to the Dörböd, Hidehiro Okada argues that they descend from the Naiman on the basis that the Dörböd foundation myth, which relates that their founder was born of a tree, was similar to that of the Uighurs from whom, he believes, the Naiman probably branched off and that the territory of the Dörböd was the old home of the Naiman (1987, pp. 197-201)16. As a matter of fact, the Naiman may also have had a smilar founding legend. Rashīd al-Dīn relates that “Bugu Khan [the Naiman ruler] held a great importance among the Uyghur and many peoples. They say he was born of a tree” (1988, p. 98; 1998-1999, 1, p. 69). In sum, unlike the Chinggisid uluses that were made up of the original Mongol peoples and the non-Mongol peoples from both the Mongolian and Qipchaq steppes, the 15th-century Oirats were mostly made up of the non-Mongol peoples from the western half of modern-day Mongolia17. 9Naturally, according to recent Y-chromosome DNA testings, the Kalmyks and the modern Mongols are, although close to each other, genetically distinguishable. More specifically, the Kalmyks, made up of the Dörböd, Torghud, and Xošoud, are characterized by the high frequency (38.7%) of the Y-chromosome haplogroup C2b1a2 (formerly known as C3c1), which is also the most widespread haplogroup among the Qazaqs (Kazakhs) (see Table 1 in Malyarchuk et al. 2013, p. 3)18. The J̌aqačin, an Oirat group residing in western Mongolia, are also characterized by the high frequency of the Y-DNA chromosome haplogroup C2b1a2 (30%), which shows that C2b1a2 can be considered the genetic marker of the Oirat groups in relation to (Qalqa) Mongols (see Table 1 in Katoh et al. 2005, p. 66; C3c in this table corresponds to C2b1a2)19. Significantly, the frequency of Y-chromosome haplogroup C2b1a2 (15-20%) of the “Eastern” Mongols is considerably lower than that of the Oirat groups. The modern-day Mongols are characterized by the high frequency (34%) of C2 (formerly known as C3) that excludes C2b1a2 (see Table 3 in Zerjal et al. 2002, p. 474; haplogroup 10 in Table 3 corresponds to haplogroup C2). Furthermore, the widespread Y-chromosome haplotype dubbed “star cluster,” which is associated with Chinggis Khan’s lineage and found at a high frequency among the Mongols (34.78%) (Zerjal et al. 2003, pp. 717-721; “Star cluster” also belongs to C2), is rare (1.67%) among the Kalmyks (Derenko et al. 2007, p. 335)20. 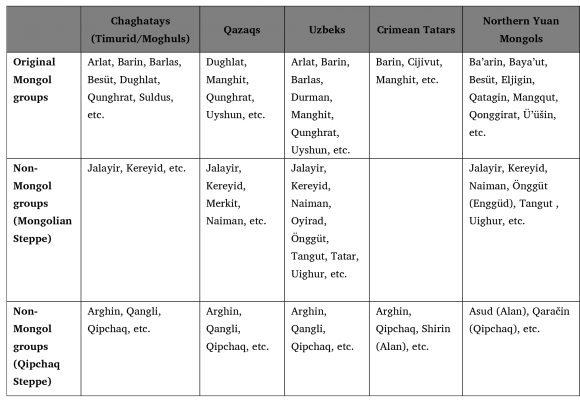 This “star cluster” is found at a high frequency (over 30%) among the Qazaqs (Kazakhs) (see Table 4 in Abilev et al. 2012, pp. 79-89), many of whose major branches, such as the Uyshun21, Manghit, Qunghrat, among others, are of Mongol origin. Whether the “star cluster” belongs to the Chinggisid lineage or not, its disproportionate distribution among the Oirats, made up of non-Mongol groups on the one hand, and the Qazaqs (Kazakhs) and Mongols, who share the Chinggisid dynasty and several “original Mongol” groups on the other, shows that the Oirats and the Mongols are genetically distinguishable. In other words, the Y-chromosome DNA test results strongly suggest that the Dörbön Oyirad and the Northern Yuan Mongols had (at least regionally) separate patrilineal ancestors. 10Therefore, the three centuries-long warfare between the Oirats and the Chinggisid Mongols after the collapse of the Yuan Dynasty should be viewed as a conflict between two separate nomadic peoples rather than as an internecine struggle between “Western Mongols” and “Eastern Mongols”. 11Despite their distinct origins, the Oirats were viewed as a Mongol-affiliated people by their Chinese and Manchu neighbors22. In the Mingshi [History of the Ming Dynasty], an official Chinese history (zhengshi) that contains a detailed account of the Oirats and the Northern Yuan Mongols, the Oirats (wala) are defined as a Mongol “tribe” (buluo) (Zhang Tingyu 1974, 328.8497), while the Northern Yuan Mongols, referred to as Dada, or Tatar, are defined as “Mongols, the descendants of the former Yuan” (ibid., 327.8463). It is not clear whether or not defining the Oirats as a Mongol-affiliated people reflects the medieval Chinese practice of attributing the origins of specific nomadic peoples to their predecessors in the Mongolian steppes23. 25 The Oirats who remained in the Volgar region are the ancestors of the modern-day Kalmyks. 12The Manchu Qing state also regarded the Oirats as belonging to the larger Mongol group (on the Manchu Qing notion or re-creation of “Mongol” identity, see Crossley 2006, pp. 64-79). For instance, the Oirats that submitted to the Qing were organized under the category of “Outer Jasaγ Mongol” (wai zhasake Menggu 外札萨克蒙古), one of the two components of “Mongol Outer Vassals” (waifan Menggu 外藩蒙古)24. Notably, the poem written by Emperor Qianlong (r. 1735-1796) in celebration of the return of the Oirats (Torghud) from the Volga region in 1771 shows that the Manchu dynasty regarded the Oirats as Mongols25. The poem includes the following lines: “(Out of) all who belong to the Mongol stock, none are not the subject of our Great Qing State”26. 13During the post-Mongol period, some Central Asian27 writers designated the nomads of the Mongolian steppes as Qalmaqs, without clearly distinguishing between the Oirats and the Northern Yuan Mongols28. For instance, to denote the state and people from which Tāizhī Oghlan, a Chinggisid contender to the throne of the Northern Yuan, came in order to take refuge with Temür (r. 1370-1405), the Timurid historian Sharaf al-Dīn ʿAlī Yazdī uses the names Ulugh Yūrt (Great Yurt)29 and Qalmāq in his Ẓafarnāma (1957, 2, p. 33)30. Muḥammad Ḥaidar Dughlāt Mīrzā, the author of the Tārīkh-i Rashīdī, the mid-16th-century history of the Moghul Khanate, refers to “the original seat” (maqarr-i aṣlī) of Chinggis Khan, that is, modern-day Mongolia as Qara qorum (Qarāqurūm) and Qalmaq (Qālīmāq) (2004, p. 426; 1996, p. 188)31. Muḥammad Yūsuf Munshī makes mention of “the Qalmaq sultans” (salāṭīn-i qalmāq) who, he writes, are descended from Ögödei Khan (r. 1229-1241) in his Tazkira-i Muqīm Khānī, a history of the Shibanid and Toqay-Timurid Uzbeks written in 1704 (2001, p. 78)32. Perhaps following the Central Asian practice, the 16th-century Ottoman historian Seyfī Çelebī refers to the nomads of the Mongolian steppes and their Chinggisid ruler Altūn Khan as Ḳalmaḳ (1968, p. 70)33. When Sulṭān Muḥammad Uzbek Khan, along with his own īl and ulūs, attained the blessing and favor of God, his Excellency Sayyid ʿAṭā brought all of them to the region of Transoxiana and those who stayed behind without the blessing of Sayyid ʿAtā were designated Qalmāq, which means “those who remained behind.” The people who left in the company of Sayyid ʿAtā and Sulṭān Muḥammad Uzbek Khan took the name of their commander and pādshāh, which was Uzbek, whenever anyone asked ‘Who is this newcomer?’ For this reason, from that time, the men who came were called Uzbak and the men who stayed behind became known as Qalmāq34. A number of peoples from this Mongol and Tatar people had to remain without the benefit of Islam, he said, and in reality, the group that is called Qalmaq from among the Tatars, who were known as Torghud, was left without becoming Muslim35. 16Another explanation of the origin of the Qalmaqs is offered in the Majmūʿ at-tavārīkh, a 16th-century Uzbek history (for more on this history, see Romodin 1973, pp. 200-203), which provides a pseudo-historical account of the origin of the ninety-two branches that constituted the Uzbeks. According to this account, the Qalmaqs are descended from the sons who deviated from Islam after the death of their father Qalmaq, one of the ninety-two “Ghuz” men, who had converted to Islam during the Prophet’s time36. 40 Temür is also referred to as a Kalmak in a Nogay epic (Kara 2010, p. 172). 17In sum, in post-Mongol Central Asia, the Qalmaqs were thought to be the Uzbeks or Tatars37 who had not converted to Islam38. What this signifies is that Qalmaq was not a name reserved for the Oirats. It could encompass the Northern Yuan Mongols as well as other Mongolic and Turkic nomads, who were non-Muslims. For instance, in another pseudo-historical account given in the Majmūʿ at-tavārīkh, Qalmaq is used to denote the Qara Khitai who warred against Bartan Khan, the grandfather of Chinggis Khan (Saĭf ad-din 1996, p. 31)39. The name Qalmaq was also used by the Qazaqs to designate not only the Oirats but also the Shamanist Turkic Altai-khizi and Telengits (Kara 2010, pp. 170-171)40. Because of Eski Kırım, the Tatars of Hülegü, the Tatars of Chinggis Khan, the Tatars of Temür, and the Tatars of Toqtamïsh Khan came to Crimea and left after assaulting and plundering42. 19In his work, Evliya Çelebi also decribes the Oirats as “Qalmaq Tatar (Kalmık Tatarı), who are world travellers” (2000, p. 309, 329). He even remarks that the Ottomans are a branch of Tatars: “Even the Ottoman Dynasty and all Turkmen peoples are from the Tatar people” (hattā Āl-i Osmān ve cumle ḳavm-i türkmān dahi ḳavm-i tatar’dır) (ibid., p. 194). As a matter of fact, Muslim writers in general shared a similar view with Evliya Çelebi and regarded various Turkic and Mongolic groups as kindred peoples although they used the term Turk instead of Tatar as a collective name (Lee 2016, pp. 108-111, 118-121). 43 Kalmyk is the Russianized form of Qalmaq. 21Evliya Çelebi, who visited the Oirats of the Volga region, the forebears of modern-day Kalmyks43, in 1666, differentiates between the Oirats and the Mongols. Specifically, he reserves the term Qalmaq for the Oirats and when referring to Chinggis Khan and the Mongols, he uses the terms Tatar and Mongol (Moġul)44. In addition, he does not use the term Mongol for the Oirats. One should note that, to Evliya Çelebi, the Crimean Tatars, not the Oirats (Kalmyks), were the true heirs of Chinggis Khan. 22Likewise, the histories produced in the Chinggisid and Timurid states of Central Asia do not identify the Oirats, to whom they refer as “Qalmaqs”, and the Mongols45. In the above-cited Majmūʿ at-tavārīkh, the Oirats (Qalmaqs) appear as the enemies of Chinggis Khan’s son Tuluy, who defeats the former with the Mongol army led by Ong Khan (Saĭf ad-din 1996, pp. 40-41)46. Similarly, Sharaf al-Dīn ʿAlī Yazdī does not refer to the Mongols or Chinggis Khan as Qalmaq. Neither does Muḥammad Ḥaidar Dughlāt Mīrzā, a Moghul himself belonging to the Mongol Dughlat, designate the Oirats (Qalmaqs) as Mongol (Mughūl). He applies Mongol only to the members of the former Chaghatayid Khanate, that is, the Moghuls (eastern Chaghatays) and the Timurids (western Chaghatays) as can be seen in his following words: “The Moghul has become divided into two branches. One is the Moghul and the other is the Chaghatay”47. His maternal cousin Ẓahīr al-Dīn Muḥammad Babur (r. 1526-1530), the founder of the Timurid Mughal Empire, does not designate the Oirats (Qalmaqs) as Mongol (Moġul) in his memoirs, while being aware that they spoke a Mongol language48. He reserves Mongol for the eastern Chaghatays, whom he never calls Qalmaq. Abū al-Ghāzī Bahādur Khan (r. 1644-1663), a Chinggisid himself, also differentiates the Oirats (Qalmaqs), more specifically, the Torghud, and the Mongols in his Šejere-i Türk. In his account of the Inner Asian nomadic peoples, Abū al-Ghāzī Bahādur Khan describes the Torghud as belonging to the Oirats and does not associate them with the Mongol branches (1970, pp. 45-46 [text & trans.]). Accordingly, although Abū al-Ghāzī Bahādur Khan knew that the Oirats spoke a Mongol language49, he neither uses Mongol for the Oirats (Qalmaqs), nor does he use Qalmaq for the Mongols and the Chinggisids. The Däftär-i Čingiz-nāmä, a late 17th-century history of the Chinggisids, based on the oral traditions of the Volga Tatars, differentiates the Oirats (Qalmaqs) from the Chinggisids. According to the pseudo-historical account of Chinggis Khan given in this history, the Chinggisids are descended from Alan Qo’a, who gave birth to Chinggis Khan after the death of her husband Duyïn Bayan (Usmanov & Ivanics (eds.) 2002, p. 45). With regard to the Oirats (Qalmaqs), it just mentions that their royalty (törä) is descended from Chinggis Khan’s uncles, who were sent to the Qalmaq land by Chinggis Khan’s grandfather Tumaul Märgän Khan (ibid., pp. 37-38). The terrible ferocity and violence of the army of the Qazaqs, who, previously, at the time of the appearance of Chinggis Khan, were called the army of the Tātārs, are well known and mentioned by the Arabs and the Persians54. 25A Qazaq named Sultan Qanayev also told the 19th-century Russian ethnographer N. I. Grodekov that the Qazaqs descend from three hundred Mongols as follows: “There were two brothers: Moghul and Tatar. From the former originate the Qazaqs. The Mongols fought against the Tatars and were defeated by them. Three hundred men escaped from the battle and began to call themselves the Three Hundred” (Grodekov 1889, p. 2). Similarly, the late 19th-century Qazaq historian Qurbān-ʿAlī Khālidī argues in his Tavārīkh-i khamsa-i sharqī that the Qazaqs are descended from the Mongols and Tatars who converted to Islam (Qūrbanğali Halid 2006, pp. 44-45, 209). 26In sum, the Timurid, Uzbek, Tatar, and Qazaq historians often described themselves as descending from the Mongols, while differentiating themselves from their contemporary Qalmaqs. At this time, there were twelve kingdoms that unreservedly harmed their people […] the lord of the Qarluq was called Arslan. The lord of the Oirat was called Quduqa Beki […] the lord of the Uighur was called Idiqut. The lord of the Naiman was called Taiyang […] The lord of the Jurchen was called Xiangzong […] They were all violent, tyrannical, and immoral. The people could not bear the suffering. 59 Toγmaγ was the name used by the Mongols to denote the nomads of the Qipchaq Steppe. 61 For an English translation of the biography of Zaya Pandita, see Taupier 2014, pp. 186-256. 62 For an English translation of the Great Code of the Forty, see Taupier 2014, pp. 149-185. 31The Oirat writers in general describe in their works the Northern Yuan Mongols and themselves as separate entities while they also seem to have viewed themselves as part of a larger Mongolic-speaking group. For instance, in the Sarayin gerel [Light of the moon], the biography of the Oirat Buddhist scholar Zaya Pandita written in Zungharia around 1690, the Oirats and the Mongols are called by their respective names. However, the Oirats and the Mongols are, in their entirety, called “those who speak Mongolian” (mongγol keleten) (see Tsoloo & Rinchen (eds.) 1967, pp. 3-4)61. Similarly, the Great Code of the Forty and Four issued in 1640 as a Mongol-Oirat alliance treaty62 designates the Oirats and the Mongols by their respective names, while it uses the term “Great Aimag Ulus” perhaps to denote the Mongol-Oirat state as opposed to the Manchu state (Taupier 2014, p. 104). The Dörbön oyirodiyin töüke [Four Oirat history] written by Gabang Šarab in 1737, which narrates the origin and history of the Oirats, treats the Oirats and the Northern Yuan Mongols as separate groups, for instance, referring to the former as Dörbön Oyirod (Four Oirat) and the latter as Döčing Mongγol (Forty Mongol) (1967, p. 74)63. The Dörbön oyirodiyin töüke also relates that the Dörböd and Zunghar originated from a common ancestor, an infant created or nourished by a sacred tree (ibid., p. 77). Importantly, such origin myth was absent among the Mongols. The Oirats and the Northern Yuan Mongols are also described as separate peoples in the Dörbön oyirad mongγolyigi daruqsan tuuji [The tale of how the Four Oirat defeated the Mongols], a 17th-century Oirat history that describes the 1623 Mongol-Oirat battle, which resulted in the rise of the Zunghars (on this history, see Sukhbaatar 2014, p. 115). For instance, the author begins his account of the battle by relating that the 80 000 strong Mongols attacked “the alien Four Oirats” (qari dörbön oyirad) and sums it up by stating that “this is the way the Four Oirat defeated the Mongols” (dörbön oyirad mongγoli daruqsan ene) (Gomboyev 1858, p. 198, 210 [text], p. 213, 224 [trans.]) The separate Oirat identity is also attested to in the Buryat oral traditions recorded by Sergey Baldaev in 1937. In their legends depicting the 16th-century Qalqa Mongol invasion of the Buryats, who formed one of the Dörbön Oyirad branches, the Mongol nobles are described as foreign invaders (Natsagdorj 2015, p. 6; Baldaev 2012, pp. 317-318). We even said [to the Russians] that all of us [the Oirats, Ishteks, Qara Kalpaks, and Qazaqs] are from the Chinggisid dynasty and we belong to the same clan. We are in unity with each other64. 33Here, Ayuki Khan was probably pretending to be a Chinggisid in order to boost his legitimacy in the eyes of the Russians and Ottomans. The other peoples that Ayuki Khan mentioned as belonging to the same clan as the Kalmyks in this message were the Ishteks (İştek), the Qara Kalpaks, and the Qazaqs (Ḳirġīz Ḳazāġī) (Başbakanlık arşivi Name-i hümâyûn defteri 6, p. 201; for the Ishteks, see Khodarkovsky 1992, p. 146, note 47). That is, they were Turkic peoples and, with the exception of the Qazaqs, non-Chinggisids. Therefore, Ayuki Khan’s remarks likely reflected a broader Inner Asian steppe identity rather than a pan-Mongol identity. We had originally lived in one place, being very amicable towards each other. Because Galdan Bošugtu Khan was not on good terms with you all, we lived scattered. Later, you all submitted to the Middle Kingdom (China), rendering service and paying tribute, which is deeply regrettable. You all are the descendants of Chinggis Khan, and are not people’s subordinates. Why not move your pastoral nomadic [activities] to the Altai again, join us to live in one place, and enjoy peace and happiness together, so that the former friendship may be reinstated ? If war occurs, we shall join forces to resist65. 66 “喀爾喀、厄魯特、法教相同, 本屬和好。及噶爾丹博碩克圖時失睦” (ibid., p. 491). 35In another message, Galdan Čering remarks that “the Qalqas and the Oirats have the same religion and were originally on good terms, and lost harmony during Galdan Bošugtu’s time […]”66 In sum, in these messages, Galdan Čering only emphasizes their common religion, past friendship, and geographic proximity, without mentioning some sort of common Mongol identity between the Oirats and the Northern Yuan Mongols. It may therefore be inferred that the Zunghar leaders did not identify themselves with the Northern Yuan Mongols. 36In this article, I have demonstrated that the Oirats and the Mongols had separate tribal origins and history: first, when Chinggis Khan established the Mongol ulus, or state, in 1206, the Oirats, who had been inhabiting the forest region of northwestern Mongolia, did not constitute the original Mongol tribes, who were made up of the Dürlükin Mongols and the Niru’un Mongols according to Rashīd al-Dīn’s classification; second, after the breakup of the Mongol Empire, the Oirats transformed into a nomadic confederation, the Dörbön Oyirad, or Four Oirat, which was mostly made up of the tribes of non-Mongol origin. Importantly, the Y-chromosome DNA testings of the Kalmyks and the modern Mongols show that the two are genetically distinguishable. 37Concerning the practice of designating the Oirats as “Western Mongols” in modern literature, it is true that this has a certain historical basis. The Manchu Qing treated the Oirats as a Mongol “tribe”. In addition, the Oirat writers tended to view the Oirats as belonging to the larger Mongolic-speaking people. However, they also regarded the Oirats and the Northern Yuan Mongols as two distinct groups. In the real political world, the Zunghar rulers Galdan Bošugtu and Galdan Tsering demonstrated a non-Mongol identity. Similarly, the Northern Yuan Mongols viewed the Oirats as foreign enemies (qari daisun). Furthermore, the various historians of the Chinggisid and Timurid states in post-Mongol Central Asia differentiated between the Oirats and the Mongols, while identifying the Chinggisids and the Timurids with the latter. 38Consequently, the present author maintains that the three-century-long warfare between the Oirats and the Northern Yuan Mongols following the break-up of the Yuan Dynasty should be regarded as a conflict between two separate nomadic peoples, not as an internecine struggle between “Western Mongols” and “Eastern Mongols”. This is not to say that the Oirat tribes that now reside in the Mongolian People’s Republic and those modern-day Kalmyks who possess a Mongol identity may not be regarded as Mongols. The historical Oirats may also be classified as a Mongolic people. However, one should bear in mind that the Oirats undermined the Chinggisid supremacy in the Mongolian and Qipchaq steppes during the post-Mongol period as Oirats, not as Mongols. From the standpoint of Inner Asian history, the Oirats would have become a new dominant nomadic people of Inner Asia, supplanting both the Qazaqs and the Mongols, were it not for the Manchu intervention, just as the Xianbei and the Uighurs had supplanted the Xiongnu and the Kök Türks, respectively. I suggest that specialists in Inner Asian history should recognize the historical Oirats as a separate Inner Asian people or nomadic confederation like the Xiongnu, the Xianbei, the Kök Türks, the Uighurs, the Qirghiz, and the Mongols since characterizing them merely as “Western Mongols” may be tantamount to defining the Uighurs or the Qirghiz as “Northern Kök Türks” or the Ukrainians as “Southern Russians”. ʿAbd al-Ghaffār Qïrïmī 1924 Umdet ül-tevarikh, supplement to Türk Tarih Encümeni Mecmuası (Istanbul, Najīb ʿĀsim). Abilev, S., Malyarchuk B., Derenko M., Wozniak M., Grzybowski T. & I. Zakharov 2012 The Y-chromosome C3* star-cluster attributed to Genghis Khan’s descendants is present at high frequency in the Kerey clan from Kazakhstan, Human Biology 84(1), pp. 79-89. Aboul-Ghâzi Béhâdour Khân [1871-1874] 1970 Histoire des Mongols et des Tatares par Aboul-Ghâzi Béhâdour Khân (Amsterdam, Philo, Petr I. Desmaisons). Abuʾl-Fazl 2015 The history of Akbar, volume I., W. M. Thackston (trans. & ed.) (Cambridge, Mass., Harvard University Press). Abu’l Ghâzi Bahâder 1729 A general history of the Turks, Moguls, and Tatars, vulgarly called Tartars. Together with a description of the countries they inhabit, vol. 2 (London, Printed for J. & J. Knapton, J. Darby, A Bettesworth, F. Fayram, J. Osborn & T. Longman, J. Pemberton, C. Rivington, F. Clay, J. Batley, & Aaron Ward). Abuseitova, M. Kh. 2006 Muʿizz al-ansāb fī shajarat al-ansāb, Istoriya Kazakhstana v persidskikh istochnikakh 3 (Almaty, Dayk). Ando, Sh. 1992 Timuridische Emire nach dem Mu‘izz al-ansāb. Untersuchung zur Stammesaristokratie Zentralasiens im 14. und 15. Jahrhundert, Islamkundliche Untersuchungen 153 (Berlin, Klaus Schwarz). Atwood, C. P. 2004 Encyclopedia of Mongolian and the Mongol Empire (New York, Facts on File). 2012 Banner, otog, thousand. Appanage communities as the basic unit of traditional Mongolian society, Mongolian Studies 34, pp. 1-76. 2013 Mongols, Arabs, Kurds, and Franks. Rashīd al-Dīn’s comparative ethnography of tribal society, in A. Akasoy, R. Yoeli-Tlalim & Ch. Burnett (eds. ), Rashīd al-Dīn as an agent and mediator of cultural exchanges in Ilkhanid Iran (London, Wartburg Institute), pp. 223-50..
2015 The administrative origins of Mongolia’s ‘tribal’ vocabulary, Eurasia: Statum et Legem 1(4), pp. 7-45. Badamhatan, S. 1987 BNMAU-iin ugsaatnii züi boty 1: khalkhiin ugsaatnii züi [The ethnography of the Mongolian People’s Republic, part 1: The ethnography of the Qalqas] (Ulaanbaatar, Sinzlech Uchaany Akademi). Baldaev, S. P. 2012 Rodoslovnye predaniya i legendy buryat [Genealogical histories and legends of Buryat people] (Ulan-Ude, Izdatel’stvo BGU). Başbakanlık arşivi Name-i hümâyûn defteri, n° 6. Bawden, Ch. 1955 The Mongolian chronicle Altan Tobči. Text, translation and critical notes, Göttinger Asiatische Forschungen 5 (Wiesbaden, O. Harrassowitz). Bodrogligeti, A. J. E. 1993-1994 Muḥammad Shaybānī Khan’s Apology to the Muslim Clergy, Archivum Ottomanicum 13, pp. 85-100. Boyle, J. A. & G. E. Wheeler 2016 Kalmuk, in P. Bearman, Th. Bianquis, C. E. Bosworth, E. van Donzel & W. P. Heinrichs (eds. ), Encyclopaedia of Islam (Brill, online URL: http://referenceworks.brillonline.com.myaccess.library.utoronto.ca/entries/encyclopaedia-of-islam-2/kalmuk-COM_0429, consulted 1 June 2016). Crossley, P. K. 2006 Making Mongols, in P. K. Crossley, H. F. Siu, D. S. Sutton (eds. ), Empire at the margins. Culture, ethnicity and frontier in early modern China (Berkeley, University of California Press), pp. 58-82. Derenko, M. V., Malyarchuk B. A., Wozniak M., Denisova G. A., Dambueva I. K., Dorzhu C. M., Grzybowski T. & I. A. Zakharov 2007 Distribution of the male lineages of Genghis Khan’s descendants in northern Eurasian populations, Russian Journal of Genetics 43(3), pp. 334-337. Dulik, M. C., Osipova L. P. & T. G. Schurr 2011 Y-chromosome variation in Altaian Kazakhs reveals a common paternal gene pool for Kazakhs and the influence of Mongolian expansions, PLoS One 6(3). Eertai 鄂爾泰 1985 Qing Shilu 清實錄 8: Shizong xian huangdi shilu 世宗憲皇帝實錄 2 (Beijing, Zhonghua shuju). Elverskog, J. 2003 The jewel translucent sūtra. Altan Khan and the Mongols in the sixteenth century (Leiden, Brill). Evliya Çelebi 2000 Evliya Çelebi Seyahatnâmesi, vol. 7 (Istanbul, Yapı Kredi Yayınları). Fażlallāh b. Rūzbihān Khunjī. 1962 Mihmān-nāma-i Bukhārā. Tārīkh-i pādshāhī-i Muḥammad Shībānī (Tehran, Bungāh-i Tarjuma va Nashr-i Kitāb). Fisher, A. 1978 The Crimean Tatars (Stanford, CA, Hoover Institution Press). Frank, A. J. 2009 The Mongōl-Qalmāq bayānī. A Qing-era Islamic ethnography of the Mongols and Tibetans, Asiatische Studien/Etudes Asiatiques 63 (2), pp. 323-347. Gavang Sharav [Γabang Šes-rab] 1967 Gavang Sharav Dörvön Oyrdyn tüükh, in Zh. Tsoloo & Rinchen (eds. ), Biography of Caya Pandita in Oirat Characters, Corpus scriptorum Mongolorum: Instituti Linguae et Litterarum Akademiae Scientiarum Reipublicae Populi Mongolici, Tomus V, Fasc. 2-3 (Ulaanbaatar, Shinjlekh Ukhaany Akadyemiin Khevlel). Gomboyev, L. G. 1858 Altan-tobchi mongol’skaya letopis’ v podlinnom tekste i perevode, s prilozheniyem kalmytskago teksta Istorii Ubashi-Khuntaydzhiya i ego voyny s oyratami, Trudy Vostochnago otdeleniya Imperatorskago arkheologicheskago obshchestva 6 (St. Petersburg, v Tipografii Imperatorskoy akademii nauk). Grodekov, N. I. 1889 Kirgizi i karakirgizy Syr-Dar’inskoi oblasti, vol. 1 (Tashkent, Tipo-Litografya S. I. Lakhtina). Grousset, R. 1939 L’Empire des steppes. Attila, Gengis-khan, Tamerlan (Paris, Payot). Haenisch, E.  1962 Manghol un niuca tobca’an (Yüan-ch’ao pi-shi), Die Geheime Geschichte der Mongolen aus der chinesischen Transkription (Ausgabe Ye Teh-hui) im mongolischen Wortlaut wiederhergestellt, vol. 2, Worterbuch zu Manghol un niuca tobca’an (Yüan-ch’ao pi-shi) (Wiesbaden, Steiner Verlag). Halkovic, S. A. Jr. 1985 The Mongols of the West, Indiana University Uralic and Altaic Series 148 (Bloomington, RIIAS, Indiana University). Hambis, L. 1969 Documents sur I’histoire des Mongols à l’époque des Ming (Paris, Presses Universitaires de France). Haydar Dughlat [Muḥammad Ḥaidar Dughlat] 1996 Tarikh-i-Rashidi. A history of the khans of Moghulistan, W. M. Thackston (trans. & ed. ), 2 vols., Sources of Oriental Languages and Literatures 37-38 (Cambridge, MA, Harvard University). Irmukhanov, B. B. 2006 Usun’ i etnogenez kazakhskogo naroda (Almaty, Nash Mir). İnalcık, H. 1955 Kırım hanlığı, İslâm Ansiklopedisi, vol. 6 (Istanbul). Jamsran, L. (ed.) 2003 Mongol ulsyn tüükh, vol. 3, XIV zuuny dund üyees XVII zuuny ekhen üye [The history of Mongolia, vol. 3, from the mid-14th century to the early 17th century] (Ulaanbaatar, Mongol Ulsyn Shinjlekh Ukhaany Akademi Tüükhiin Khüreelen). 2010 The crisis of the Forty and the Four, in D. Sneath & C. Kaplonski (eds. ), The History of Mongolia, vol. 2, Yuan and late medieval period (Folkestone, Global Oriental), pp. 497-507. Kara, D. S. 2010 “Kalmak”. The enemy in the Kazak and Kirghiz epic songs, Acta Orientalia Academiae Scientiarum Hungaricae 63 (2), pp. 167-178. Karasoy, Y. (ed.) 1998 Şiban Han dîvânı (Ankara, Türk Dil Kurumu). Katoh, T., Munkhbat B., Tounai K., Mano S., Ando H., Oyungerel G., Chae G. T., Han H., Jia G. J., Tokunaga K., Munkhtuvshin N., Tamiya G. & H. Inoko 2005 Genetic features of Mongolian ethnic groups revealed by Y-chromosomal analysis, Gene 346, pp. 63-70. Khodarkovsky, M. 1992 Where two worlds met. The Russian state and the Kalmyk nomads, 1600-1771 (Ithaca & London, Cornell University Press). Krueger, J. R. 1969 Three Oirat-Mongolian diplomatic documents of 1691, Central Asiatic Journal 12(4), pp. 286-289, 291-295. Lee, J. Y. 2016 The historical meaning of the term Turk and the nature of the Turkic identity of the Chinggisid and Timurid elites in post-Mongol Central Asia, Central Asiatic Journal 59, pp. 101-132. Li Yangshou李延壽 2003 Beishi 北史 [History of the Northern Dynasties] (Beijing, Zhonghua shuju). Ligeti, L. (ed.) 1971 Histoire secrète des Mongols, Monumenta linguae mongolicae collecta 1 (Budapest, Akadémiai Kiadó). Liu Xu劉昫 2002 Jiu Tangshu 舊唐書 [Old book of the Tang Dynasty] (Beijing, Zhonghua shuju). Lomi 1957 Mongγol Borǰigid oboγ-un teüke. Meng-ku shih-hsi-p’u (Wiesbaden, O. Harrassowitz). Maḥmūd b. Amīr Valī 1984 Baḥr al-asrār fī maʿrifat il-akhyār, vol. 1, part 1 (Karachi, Pakistan Historical Society). Malyarchuk B., Derenko M., Denisova G., Khoyt S., Woźniak M., Grzybowski T. & I. Zakharov 2013 Y-chromosome diversity in the Kalmyks at the ethnical and tribal levels, Journal of Human Genetics 58, pp. 804-811. Mano, E. 1978 Moghūlistān, Acta Asiatica. Bulletin of the Institute of Eastern Culture 34, pp. 46-60. Manz, B. F. 1989 The rise and rule of Tamerlane (Cambridge, Cambridge University Press). 1970 T̤abaḳāt-i-Nāṣirī. A general history of the Muhammadan dynasties of Asia, including Hindustan, H. G. Raverty (trans. ), 2 vols (New Delhi, Oriental Books Reprint). Miyawaki, J. 1984 The Qalqa Mongols and the Oyirad in the seventeenth century, Journal of Asian History 18(2), pp. 136-173. 1995 Saigo no yūboku teikoku. Jūngarubu no kōbō [The last nomadic empire: the rise and fall of the Zunghars] (Tokyo, Kōdansha). 2000 The legitimacy of khanship among the Oyirad (Kalmyk) tribes in relation to the Chinggisid principle, in R. Amitai-Preiss & D. O. Morgan (eds. ), The Mongol Empire and Its Legacy, Islamic History and Civilization 24 (Leiden, Brill), pp. 319-31. 2003 The Dzungars and the Torguts (Kalmuks) and the peoples of Southern Siberia, I. History of the Dzungars: introductory survey, in A. H. Dani (ed. ), History of civilizations of Central Asia, vol. 5 (Paris, Unesco), pp. 141-51. Muḥammad Ḥaidar Dughlat Mīrzā 2004 Tārīkh-i Rashīdī (Tehran, Mīrās-i Maktūb). Muḥammad Yūsuf Munshī 2001 Taẕkira-i Muqīm Khānī (Tehran, Mīrāṣ-i Maktūb). Munkh-Erdene, Lhamsuren 2011 Where did the Mongol Empire come from? Medieval Mongol ideas of people, state and empire, Inner Asia, 13 (2), pp. 211-37. Ṅag-dBaṅ Blo-bZaṅ rGya-mTSHo 2008 The song of the queen of spring, or, a history of Tibet. (New Delhi, International Academy of Indian Culture and Aditya Prakashan). Natsagdorj, T. B. 2015 On the people of Khariad (Qariyad), Études mongoles & sibériennes, centrasiatiques & tibétaines 46 [online, URL: http://emscat.revues.org/2490]. Niẓām al-Dīn Shāmī 1937 Histoire des conquêtes de Tamerlan intitulée Ẓafarnāma, par Niẓāmuddīn Šāmī, vol. 1, Texte persan du Ẓafarnāma (Prague, Oriental Institute). Okada, H. 1984 Mongol chronicles and Chinggisid genealogies, Journal of Asian and African Studies 27, pp. 147-54. 1987 Origins of the Dörben Oyirad, Ural-Altaische Jahrbücher 7, pp. 181-211. Ötämiš Ḥājī 2008 Čingīz-Nāma. Introduction, annotated translation, transcription and critical text, Studia Culturae Islamicae 94 (Tokyo, Research Institute for Languages and Cultures of Asia and Africa). Ouyang Xiu歐陽修& Song Qi宋祁 2003 Xin Tangshu 新唐書 [New book of the Tang Dynasty] (Beijing, Zhonghua shuju). Pelliot, P. 1960 Notes critiques d’histoire kalmouke, texte, Oeuvres posthumes de Paul Pelliot 6 (Paris, Librairie d’Amérique et d’Orient). Qūrbanğali Halid 2006 Tauarih hamsa: bes tarih (Astana, Altyn kitap). Rachewiltz, I. de (trans. & ed.) 2004 The Secret History of the Mongols. A Mongolian epic chronicle of the thirteenth century, 2 vols (Leiden, Brill). Rashīd al-Dīn Fażlullāh Hamadānī 1988 Jāmiʿ al-tavārīkh (Tehran, Intishārāt-i Iqbāl). Rashiduddin Fazlullah [Rashīd al-Dīn Fażlullāh Hamadānī] 1998-1999 Jami‘u’t-tawarikh (Compendium of Chronicles). A history of the Mongols (Cambridge, Mass., Harvard University). Romodin, V. A. 1973 Materialy po istorii kirgizov i Kirgizii, vol. 1 (Moscow, Nauka). Rota, G. 2006 Safavids and Kalmyks in the 17th century. A preliminary assessment, in A. Panaino & R. Zipoli (eds. ), Proceedings of the 5th Conference of the Societas Iranologica Europaea, vol. 2, Classical & Contemporary Iranian Studies (Milan, Mimesis). Saγang Sečen 1990 Erdeni-yin Tobci (‘Precious Summary’). A Mongolian chronicle of 1662. M. Gō, I. de Rachewiltz, J. R. Krueger & B. Ulaan (ed. ), vol. 1, The Urga text (Canberra, The Australian National University). Saĭf ad-din ibn damullo Shakh Abbas Aksikenti 1996 Tarykhtardyn zhyĭnagy (“Mazhmu atut-tavorikh”) (Bishkek, “Akyl” mamkontserni). Seyfī Çelebī 1968 L’ouvrage de Seyfī Çelebī. Historien Ottoman du XVIe siècle (Paris, Librairie Adrien Maisonneuve). Sharaf al-Dīn ʿAlī Yazdī 1957 Ẓafar-nāma. Tārīkh-i ʿumūmī mufaṣṣil-i Irān dar daura-i Tīmūrīyān (Tehran, shirkat-i sahāmī-i chāp-i rangīn). Shīr Muḥammad Mīrāb Mūnīs & Muḥammad Rīżā Mīrāb Āgahī 1988 Firdaws al-Iqbāl: History of Khorezm (Leiden, Brill). 1999 Firdaws al-iqbāl. History of Khorezm (Leiden, Brill). Sneath, D. 2007 The headless state. Aristocratic orders, kinship society, and misrepresentations of nomadic Inner Asia (New York, Columbia University Press). Stein, R. A. 1959 Recherches sur l’épopée et le barde au Tibet (Paris, Presses Universitaires de France). Sukhbaatar, N. 2014 Clear scripts sources on Oirat history. Classification, values, and significance, in Oirat People. Cultural Uniformity and Diversification, Senri Ethnological Studies 86 (Osaka, National Museum of Ethnology). Sultanov, T. I. 1982 Kochevyye plemena Priaral’ya v XV-XVII vv. (Voprosy etnicheskoy i sotsial’noy istorii) (Moscow, Nauka). Taupier, R. P. 2014 The Oirad of the early 17th century. Statehood and political ideology. Ph.D. diss. (University of Massachusetts, Amherst). Tizengauzen, V. G. 1941 Izvlecheniya iz persidskikh sochineniy, vol. 2 of Sbornik materialov, otnosyashchikhsya k istorii Zolotoy ordy (Moscow & Leningrad, Izd-vo Akademiya nauk SSSR). Tsoloo, Zh. & Rinchen (eds.) 1967 Biography of Caya Pandita in Oirat characters. Corpus scriptorum Mongolorum: Instituti Linguae et Litterarum Akademiae Scientiarum Reipublicae Populi Mongolici, V(2-3) (Ulaanbaatar, Shinjlekh Ukhaany Akadyemiin Khevlel). Usmanov, A. M. & M. Ivanics (eds.) 2002 Das Buch der Dschingis-Legende (Däftär-i Čingiz-nāmä), Studia Uralo-Altaica 44 (Szeged, University of Szeged). Valikhanov, Ch. 2009 Predaniya i legendy bolshoy Kirgiz-Kaysatskoy ordy, in S. F. Mazhitov, G. K. Anes & E. Zh. Valikhanov, Izbrannye proizvedeniya (Almaty, Izdatel’stvo Arys,), pp. 455-59. Veliaminof-Zernof, V. 1864 Matériaux pour servir à l’histoire du Khanat de Crimée. Extrait, par ordre de l’Académie impériale des sciences, des archives centrales du Ministère des affaires étrangères, à Moscou (St. Petersburg). Wei Zheng魏徵 2008 Suishu 隋書 [Book of the Sui Dynasty] (Beijing, Zhonghua shuju). Wu, C. Y. 1941 Who were the Oirats?, Yenching Journal of Social Studies 3(2), pp. 174-219. Yudin, V. P. 2001 O rodoplemennom sostave mogulov Mogulistana i Mogulii i ikh etnicheskikh svyazyakh s kazakhskim i drugimi sosednimi narodami, in V. P. Yudin, Tsentral’naya Aziya v XIV-XVIII vekakh glazami vostokoveda (Almaty, Dayk), pp. 72-95. Ẓahīr al-Dīn Muḥammad Babur 1995-1996 Bābur-nāma (Vaqāyiʿ), 2 vols (Kyoto, Syokado). Zahiruddin Muhammad Babur Mirza 1993 Baburnama (Cambridge, MA, Harvard University). Zerjal, T., Wells R. S., Yuldasheva N., Ruzibakiev R. & C. Tyler-Smith 2002 A genetic landscape reshaped by recent events. Y-chromosomal insights into Central Asia, The American Journal of Human Genetics 71(3), pp. 466-82. Zerjal, T., Xue Y., Bertorelle G., Wells R. S., Bao W., Zhu S., Qamar R., Ayub Q., Mohyuddin A., Fu S., Li P., Yuldasheva N., Ruzibakiev R., Xu J., Shu Q., Du R., Yang H., Hurles M. E., Robinson E., Gerelsaikhan T., Dashnyam B., Mehdi S. Q. & C. Tyler-Smith 2003 The genetic legacy of the Mongols, American Journal of Human Genetics 72(3), pp. 717-721. Zhang Tingyu 張廷玉 1974 Mingshi明史 [History of the Ming Dynasty] (Beijing, Zhonghua shuju). 2 This article uses several different systems of transliteration. For Persian and Ottoman Turkish words, it follows the English transliteration system of the International Journal of the Middle East Studies, with the following exceptions for Ottoman Turkish : s for ث, ḫ for خ, z for ذ, and ġ for غ. For Chaghatay Turkic, it generally follows János Eckmann. The pinyin system for romanizing Chinese and the modified Hepburn system for Japanese have been employed in this work. For Classical Mongolian and medieval Mongolian, it generally follows Antoine Mostaert’s and Igor de Rachewiltz’s transcription systems, repectively. For Oirat script, it uses the following transcription system, accessed August 27, 2016, http://www.omniglot.com/writing/kalmyk.htm. Some names of peoples are used in their widely accepted Anglicized spellings such as Oirat, Zunghar, and Torghut with their Classical Mongolian and/or Oirat forms in Latin transcriptions in bracket. 3 I use the name Northern Yuan to refer to the Chinggisid state that, after the fall of the Yuan Dynasty in 1368, continued to rule the Mongolian Plateau before being incorporated into the Manchu Qing dynasty over the course of the 17th century. 4 It should be noted that several maps of Asia produced in 18th-century Europe describe the Kazakh steppes as the land of “the Qalmaqs,” which was the contemporary Turkic name for the Oirats. 5 In Mongolian scholarship, the term Western Mongol (Baruun Mongol) is often applied to the historical Oirats (for instance, see Jamsran 2003, p. 31, 33, 42, 119). 6 The present author is not concerned with theories of ethnicity. I approach the identity of the historical Oirats from the perspective of their contemporaries. My interest is not whether or not the historical Oirats and the Mongols were the same “nation” in the modern scholarly sense but whether they were viewed by themselves and others as Mongols or non-Mongols. While I do not intend to define ethnicity or identity in this article, I attempt to demonstrate all potential markers of difference between the two Mongolic groups. Other approaches may exist. To those who believe that ethnicity is situational, the Oirats and the Mongols might be one people in one context, and two peoples in another. And these contexts might change over time. 8 The Mongolian term ulus means “people (subject to a certain ruler)” or “state” (Haenisch  1962, p. 163). 9 I translate qaum (pl. aqvām) in the Jāmiʿ al-tavārīkh as “khanate” or “people” not “tribe,” following Christopher P. Atwood. For his understanding of the socio-political units of the pre-Mongol Mongolian steppes as “peoples” not “tribes,” see Atwood 2013 and 2015. David Sneath, who argues that Inner Asian nomadic societies were organized around “aristocratic orders” that formed “headless states” (for their definitions, see Sneath 2007, pp. 2-5), also views the polities of the Mongolian steppes on the eve of the Mongol conquests as “steppe powers” or “khanates” not “tribes” (ibid., pp. 29-30). 10 The members of the Barlas, Qunqirat, and Mangqut founded the Timurids, the Qunghrats of Khiva, and the Manghits of Bukhara, respectively, in post-Mongol Central Asia. 11 I included the Timurids among the Chinggisid ulus, or people, since they belonged to the Chaghatayid ulus. The designation ulūs-i Jaghatāy, or Chaghatay’s ulus, encompassed the Timurids and the Moghuls, who descended from the nomadic subjects of Chaghatay Khan. For instance, the Timurid historian Sharaf al-Dīn ʿAlī Yazdī refers to Temür’s people as “the whole Chaghatayid ulus” (tamāmī-i ulūs-i Jaghatāy), as opposed to “all the Jočid ulus” (tamām-i ulūs-i Jūchī) (1957, p. 206). 12 Therefore, the “Mongols” of the Northern Yuan had become a more heterogeneous group when compared to the 13th-century Mongols (on this point, see Crossley 2006, pp. 59-66). 13 For the origin of the (Crimean) Shirin, ʿAbd al-Ghaffār Qïrïmī, a Shirin nobleman, states in his Crimean Tatar history that it is “a branch of the As” (Āṣ ḳabīlesinden şuʿbe olan) (1924, p. 46). 14 There is no consensus concerning the identity of the original Four Oirat groups. For instance, the 17th-century Mongolian chronicle Erdeni-yin tobci mentions the Ögeled (Oirat Mo. Öölöd), Baγatud (Oirat Mo. Baatud), Qoyid (Oirat Mo. Xoyid), and Kerenügüd/Kergüd (Qirghiz or, more likely, Kereyid) as the Four Oirat groups (see Saγang Sečen 1990, p. 47). The 18th-century Oirat history Dörbön oyirodiyin töüke [Four Oirat history] states that the Dörbön Oyirad are made up of the Dörböd, Zunghar, Xošoud, and Torghud along with the Öölöd, Xoyid, Baatud, Barγu, and Buraad (Buryat) (see Gavang Sharav 1967, p. 74). The Manchu Qing sources usually make mention of the Čoros (Zunghar), Dörböd, Xošoud, and Xoyid (or Torghud instead) (for a detailed study of the tribal composition of the Dörbön Oyirad and their origins, see Okada 1987, pp. 181-211). 15 The Torghud are regarded as being originally Kereyid since their royal lineage derived from Ong Khan, the ruler of the Kereyid (Okada 1987, pp. 208-209 ; Wu 1941, pp. 188-1891 ; Howorth 1876, p. 558). 16 On the same basis, Atwood suggests that the Čoros clan, which ruled the Dörböd, were of Uighur descent (2004, p. 420). 17 Therefore, arguing that several Oirat groups descend from the Turkic Tiele and that the Kereyid were Turkic, Wu Ch’i-yu even concludes that the Oirats were a Turkic people (1941, pp. 217-219). The present author does not agree with such reasoning but shares the view with Wu that the Dörbön Oyirad were non-Mongols by origin. 18 C2b1a2 is also the major Y-DNA chromosome haplogroup of the Qazaqs (Kazakhs), including the Altai Qazaqs. 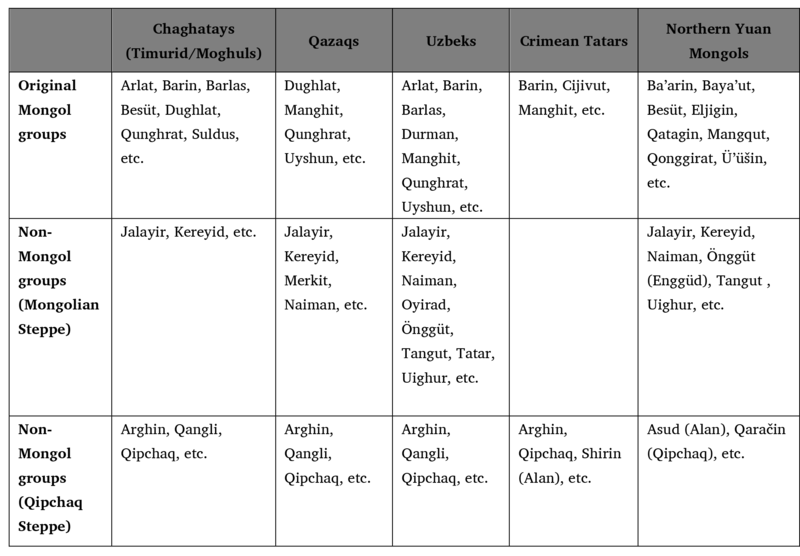 The fact that the Altai Qazaqs, who are mostly made up of the Naiman and Kereyid, are characterized by C2b1a2 may be considered as an indirect proof that the Oirats descend from the Naiman and Kereyid (for the Kazakh C2b1a2 (40-63 %), see Table 1 and Table 2 in Dulik et al. 2011, pp. 2-3 ; Table 3 in Zerjal et al. 2002, p. 474. Haplogroup 36 in Table 3 corresponds to haplogroup C2b1a2). 19 As a matter of fact, C2b1a2 also appears at high frequency among several Tungusic peoples of Siberia such as the Evenks. 20 The Altai Qazaqs (Kazakhs) (8.3 %), Altaians (3.4 %), Buryats (2.3 %), and Tuvans (1.9 %) show higher frequencies of this haplotypes than the Kalmyks. 21 Chokan Valikhanov identifies the Uyshun as the Mongol Üüsin (Valikhanov 2009, p. 455). Like Valikhanov, Beimbet Baktievich Irmukhanov, a modern Kazakh historian, argues that the modern Kazakh Uyshun descend from the Mongol Üüsin, not from the ancient Wusun (Irmukhanov 2006, pp. 95-101). 22 The Tibetans designated the Oirats as Sog and the Mongols as Hor (for instance, see Ṅag-dBaṅ Blo-bZaṅ rGya-mTSHo 2008, p. 151). Hor had also been the Tibetan designation for the Uighurs and the Yuan Mongols (Stein 1959, p. 189). 23 In the official Chinese dynastic histories, for instance, the Kök Türks, Tiele, and Uighurs, who were the Turkic-speaking groups that occupied the Mongolian steppes, are mostly classified as being of Xiongnu origin (for the Türk and the Tiele, see Li Yangshou 2003, 99.3285, 3303. For the Uighur, see Liu Xu 2002, 195.5195 ; Ouyang Xiu and Song Qi 2003, 217a.6111). The Khitan and Qay, the Para-Mongolic-speaking nomadic peoples that inhabited the former land of the Dong Hu (“Eastern Barbarian”), eastern Inner Mongolia, are classified as being of Dong Hu origin (for the Qay, see Wei Zheng 2008, 84.1881 ; Ouyang Xiu & Song Qi 2003, 219.6173. For the Khitan, see ibid., 219.6167). 24 The “Outer Jasaγ Mongol” included the Qalqa and Oirat “tribes,” among others. The “Inner Jasaγ Mongol” denoted the Mongol banners of Inner Mongolia. Jasaγs (Chinese zhasake 札萨克) were hereditary leaders of the Mongol banners in the Qing state. 26 “蒙古之族，無不爲我大清国之臣.” See “Tuerhute bu guishun jishibei 土尔扈特部归顺记石碑 [土爾扈特部歸順記石碑] [The stone inscription commemorating the submission of the Torghud “tribe”]” [online, URL : http://baike.baidu.com/view/1641511.htm, consulted 12 March 2016. 27 The term Central Asia is used in this article to indicate the interior region stretching from the Caspian Sea in the west to Xinjiang, China in the east and from Kazakhstan in the north to Afghanistan in the south. Inner Asia is used for the Eurasian steppe region. 28 In contrast, the late 19th-century Kazakh historian Qurbān-ʿAlī Khālidī (1846-1913) applies the term Qalmāq to both the Oirats and the Mongols unequivocally. In his Tavārīkh-i khamsa-i sharqī, a Turkic history of Central Asia, he uses Qalmāq both narrowly to refer to the Oirats and broadly to refer to the Tibetan Buddhist peoples, including the Mongols and Tibetans (Frank 2009, pp. 329-332). 29 Ulugh Yūrt (Great Yurt) denotes the principal ulus of the Mongol Empire that ruled over Mongolia and China. It was first led by the family of Ögödei Khan and later by the descendants of Tolui (1192-1232). 30 Reporting on Tāizhī Oghlan, Niẓām al-Dīn Shāmī refers to the Northern Yuan as mamlakat-i Khitāī, which he also calls Ūlūgh Yūrt elsewhere without mentioning the name Qalmāq (1937, p. 12, 172). According to Paul Pelliot, the earliest source that uses the term Qalmaq is Sharaf al-Dīn ʿAlī Yazdī’s Ẓafarnāma, not the Kharīdat al-ʿAjāʾib, a mid-14th-century Arabic work attributed to Ibn al-Wardī (1960, p. 3). 31 Qarāqurūm was the capital of the Mongol Empire. Perhaps, here Qarāqurūm and Qālīmāq denote central Mongolia and western Mongolia, respectively. 32 Muḥammad Yūsuf Munshī may simply have mistaken the Zunghar Oirat rulers as Chinggisids or have referred to the Northern Yuan Mongols as Qalmaq. However, one should note that when Munshī compiled his work in the early 18th century, the Northern Yuan Dynasty had ceased to exist. Although there were some Ögödeid khans in the Northern Yuan in the early 15th century, it is highly unlikely that Munshī was aware of this fact since Munshī’s knowledge of the Chinggisid genealogy seems to have been limited. For instance, he writes in his work that Joči had four sons, which is historically inaccurate. A different manuscript of his Tazkira-i Muqīm Khānī relates that Joči had two sons, Urus Khan and Shībānī Khan, which is also inaccurate (see Munshī 2001, p. 79, 79 note 14). One should also note that Timurid historians regarded Ögödei Qa’an as the first khan of the Ulugh Yūrt (for instance, see Niẓām al-Dīn Shāmī 1937, p. 12). Therefore, I am inclined to think that Munshī simply mistook the Zunghar Oirat rulers as Ögödeids. 33 It is unclear if Altūn Khan here is Altan Khan (1508-1582), the actual ruler of the Northern Yuan in the second half of the 16th century. 35 “işbu ḳavm-i moġūl ve tātār-dan bir miḳdār ḳavm islām-dan bī-behre ḳalmaḳ gerek dedi ve nefsü’l-emr-de tūrġāūt taʿbīr olunan tātār-dan ḳālmāḳ dedikleri ṭāʾife musulmān olmayup ḳaldı” (ʿAbd al-Ghaffār Qırımī 1924, p. 38). 36 I was unable to obtain the original Persian manuscript and thus have relied on the following Kyrgyz translation (Saĭf ad-din 1996, pp. 23-26). 37 The designations Tatar and Uzbek were two different names attached to the same nomadic population of the Jočid Ulus and its successor states. The term Uzbek was commonly used by Central Asian writers after the reign of Uzbek Khan while the term Tatar that had been used for the Mongols was favored by the Muscovites and Ottomans. 38 The Tārīkh-i Dūst Sulṭān or Chingīz-nāma, the 16th-century Uzbek history by Ötämiš Ḥājī, also uses Qalmaq in the sense of “non-Muslim.” In this history, the funeral ritual of Uzbek Khan (r. 1313-1341)’s father, which took place prior to the conversion of the “Uzbeks,” is described as being held in accordance with “the Qalmaq custom” (Qalmaqnïng qāʿidasï) (2008, p. 25, 82 [text]). 39 Their being a non-Turkic or a Para-Mongolic people is not the reason why the Qara Khitai are called Qalmaqs in the Majmūʿ at-tavārīkh. In the Islamic world, the Qara Khitai were viewed as a branch of Turks anyway. For instance, in his Ṭabaḳāt-i-Nāṣirī, Jūzjānī (b. 1193) refers to the Qara Khitai simply as “Turks” (1970, p. 900 ; 1963, p. 94). 41 In the above-cited Majmūʿ at-tavārīkh, the Qalmaqs (the Qara Khitai and Oirats), the Ghuz, the Qirghiz, and the Mongols, among others, are also described as kindred. They all descend from Mongol Khan, son of Oghuz Khan, grandson of Japheth (see Saĭf ad-din 1996, pp. 22-26, 30-31). It is therefore natural that the Safavids in the 17th century probably viewed the Oirats as a branch of the Uzbeks (Rota 2006, p. 194). 42 “bu Eski Kırım sebebiyle Hulāgū tatarı ve Cingiz Hān tatarı ve Timur Leng tatarı ve Tohtamış Hān tatarları Kırım’a gelüp nehb [ü] gāretler edüp gitimişlerdir” (Evliya Çelebi 2000, p. 251). 44 For instance, Evliya Çelebi calls Chinggis Khan “the ancestors of the Tatars” (ḳavm-i tatarın ecdādı) (2000, p. 309). He also refers to the Mongols proper as “Mongol nation” (moġol ḳavmi) (pp. 239, 299, 310). 45 It remains unclear how they viewed their contemporary Northern Yuan Mongols in relation to the early Mongols since they do not provide information on the former. But, according to the Erdeni tunumal neretü sudur, a Mongolian history of Altan Khan, the Turkicized Chinggisids of Moghulistan recognized the Northern Yuan Chinggisids as their kindred. The Erdeni tunumal neretü sudur relates that when Altan Khan’s learned messenger described the Chaghatayid genealogy to Shah Khan, the ruler of the Moghuls (eastern Chaghatays) (r. 1543-1570), the latter became pleased and presented tribute to Altan Khan. Similarly, ʿAbd al-Karīm (r. 1566-1594), another Moghul ruler, regarded Altan Khan as his older brother and told Altan Khan’s messengers : “Let us unify our states !” (Elverskog 2003, p. 239, 278 [text], pp. 109-110, 168-169 [trans.]). 46 Interstingly, Ong Khan appears in this pseudo-history not just as the ruler of the Kereyid, but also as the father of Toqtamïsh, the khan of the Jočid Ulus (r. ca. 1378-1395) (ibid., p. 40, 45). 47 “az ulūs-i arbaʿ yikī mughūl ast. Va mughūl bi-dū qism maqsūm shoda-ast. Yikī mughūl va dīgarī chaghatāy” (Muḥammad Ḥaidar Dughlāt 2004, p. 190). 48 To explain why his maternal uncle Sulṭān-Aḥmad Khan was called Alacha Khan, Babur writes as follows : “They say that in the Qalmaq and Moghul language, alachi means killer ; Because Sulṭān-Aḥmad Khan defeated the Qalmaqs several times and killed many people, he was called Alachi …” (Babur 1995-1996, p. 17 ; 1993, p. 22). 49 He relates that he learned the Mongolian language while he spent a year among the Qalmaqs (Abū al-Ghāzī Bahādur Khan p. 37 [text]). 50 “tamāmat-i aqvām-i mughūl az nasl-i dau shakhṣand ki dar arkana qutūqūn rafta būdand” (Abuseitova 2006, fol. 3a). 51 “ulu ordanung ulu ḫanï dešt-i ḳīpčāḳ barča moġul pādšāhï Meḥmed Girāy Ḫan” (Veliaminof-Zernof 1864, p. 2). 52 “barča ulus mendä sïġar, men bu ulusa sïġmasam. Yaḫšï yaman mendä sïġar, men bu moġula sïġmasam.” (Karasoy 1998, p. 184, 795 ; Bodrogligeti 1993-1994, p. 99). 53 “dar taużīḥ-i aḥvāl-i khavāqīn-i mughūl az badv-i ẓuhūr-i ṣubḥ-i vujūd-i masʿūd-i Yāfis ibn Nūḥ ʿalayhimā al-salām tā ayyām-i bā farjām-i ḥażrat-i khilāfat-rutbat Naẕr Muḥammad Khān” (Maḥmūd b. Amīr Valī Balkhī 1984, p. 17 [text]). 54 “ṣaulat va baʾs-i shadīd-i ʿaskar-i qazzāq ki dar zamānhā-i sābiq ki biʿādī-i ẓuhūr-i Chingīz Khān būd, īshān-rā lashkar-i tātār guftandī mashhūr va maẕkūr-i alsina-i ʿarab va ʿajam ast” (Fażlallāh b. Rūzbihān Khunjī 1962, p. 213). 55 Junko Miyawaki, the Japanese specialist in Oirat history, also argues that the Mongols viewed the Oirats as aliens (qari) (2000, p. 322 ; 1995, p. 101). 56 In this article, I have not mentioned the role of Dayan Khan’s restoration of Chinggisid power in expelling the Oirats from their previously symbiotic relation with the Mongols. It should be noted that the Mongolic speakers not included in the Dayan Khanid synthesis — Buryats, Oirats, and Daurs, among others, ended up becoming separate entities. This indicates the Dayan Khanid restoration perhaps reaffirmed in a stronger way, the gap between Oirats and Mongols. 57 In the Chinggisid genealogy given in the Erdeni-yin tobci, the Four Oirat (Dörbön Oyirad) are described as being unrelated to Alan Qo’a. More specifically, they are described as the descendants of the four sons of Du’a Soqor, the elder bother of Alan Qo’a’s husband Dobun Mergen (see Saγang Sečen 1990, p. 47). This account is repeated in some other Northern Yuan sources (see Sukhbaatar 2014, p. 122). In fact, the Secret History of the Mongols relates that the four sons of Du’a Soqor became the ancestors of the Dörben, a Mongol tribe unrelated to the Oirats (see Rachewiltz 2004, p. 3). For the Dörben, see Rashīd al-Dīn 1988, p. 149 ; Rashiduddin 1998-1999, p. 104. 58 The Menggu shixi pu 蒙古世系譜is believed to be a Chinese translation of the Mongγol Borjigid oboγ-un teüke, a geneaology of the Northern Yuan Chinggisids written by Lomi, a Chinggisid himself, by 1735 originally in Manchurian and translated into Mongolian in 1839. 60 The Erdeni tunumal neretü sudur also relates that Altan Khan established quda (marriage ally) relations with the Oirat leaders (ibid., p. 240 [text], p. 112 [trans.]) However, the Chinggisids had done so with many Turko-Mongol peoples such as the Qonggirat, Barlas, and Önggüt, among others, as well as with their sedentary vassal states such as the Qocho Uighur, Qarluq, and Koryŏ (Korea). Therefore, I do not particularly see the formation of quda relationship, basically a political alliance, as being the result of, or cause for, a shared identity. 63 However, a 19th-century anonymous Kalmyk history known as the History of the Kalmyk Khans states that the Kalmyks are of “Mongol origin” (mongγol izuur) (Halkovic 1985, p. 104 [text]). This history was written after the Oirats of the Volga region began using “Kalmyk” (xalimaq) as a self-designation. Mongγol izuur and xalimaq are transcribed from Oirat script. According to Halkovic, this history is “the closest of any of the Oirat works to a western-style history” (ibid., p. 25). For some other 19th-century Oirat histories that also refer to the Oirats as Mongols, see Sukhbaatar 2014, pp. 117-118. 64 “cümlemiz al-i Cengiziden ve bir uruġdanımız birbirimizle ittifāk dahi eyledik” (Başbakanlık arşivi Name-i hümâyûn defteri, n° 6, p. 201). 65 “並云我等原在一處居住。甚相和好。因噶爾丹博碩克圖汗、與爾等不睦。各自散居。後爾等投順中國。當差納貢。深為爾等憾之。爾等系成吉思汗之後裔。並非人之屬下。何不將游牧、仍移於阿爾泰。與我會居一處。共享安樂。以聯舊好。如有兵戎。協力相距等語。今將原書呈覽。奏入。報聞.” This message appears in a Qing imperial decree (yu 諭) referencing Galdan Čering’s message to the Qalqa Mongols (see Qing Shilu 8 : Shizong xian huangdi shilu 2, 1985, p. 484). Joo-Yup Lee, Ph.D. (2012) in Turko-Persian Studies, University of Toronto, is currently a lecturer at the University of Toronto. He publishes and works on state formation and identity in post-Mongol Central Eurasia. He lectures on the Eurasian nomadic empires including the Mongol Empire at the University of Toronto. He recently published Qazaqlïq, or ambitious brigandage, and the formation of the Qazaqs. State and identity in Post-Mongol Central Eurasia (Brill). Lee’s other publications include “The historical meaning of the term Turk and the nature of the Turkic identity of the Chinggisid and Timurid elites in Post-Mongol Central Asia”, Central Asiatic Journal 59, 2016, pp. 101-132.